Wearing white pants in winter can look a little bit unsuitable, however I think they're versatile (white is so easy to mix and match!) and practical, if you choose a comfy and warm fabric. I would love to find a pair of corduroy pants in white, but that's almost impossible, so I keep wearing my winter white jeans, which are pretty warm. And I've purchased this chanel-esque jacket at a local charity shop for less than 5€ (and it's flawless!). I found it last week, when doing some charity shopping with a friend, but I let it rest for a while, because I thought that there're too many jackets in my wardrobe. 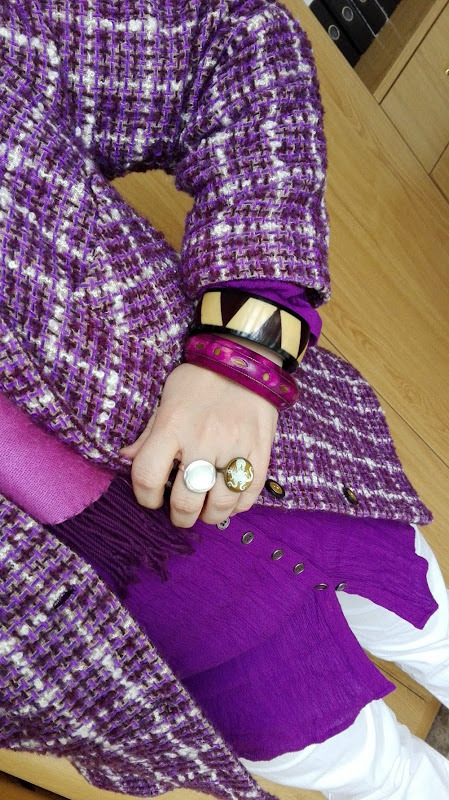 Obviously, I had to pay another visit to the charity shop, and then I couldn't resist its purple plaid-titude. Los pantalones blancos en invierno pueden parecer poco apropiados, pero creo que son muy versátiles (el blanco es bien fácil de mezclar y combinar) y son prácticos siempre que sean de un tejido cómodo y cálido. Me encantaría encontrar unos pantalones blancos de pana, pero eso es casi imposible, así que sigo con mis vaqueros blancos de invierno, que son bastante calentitos. Y he encontrado esta chaqueta 'chanelera' en una tienda de caridad, por menos de 5 pavos, y está impecable. La ví la semana pasada, cuando estaba de compras con una amiga, pero la dejé allí, descansando un rato, porque empecé a pensar que serían ya demasiadas chaquetas. Evidentemente, tuve que volver a darle otra vuelta, y ya no pude resistirme a ese color morado y los cuadros! Weren't you lucky the jacket was still there when you went back! It's gorgeous, and it looks lovely on you mixed with all the other purples and the fabulous white jeans. I was thinking of getting my white jeans out of the summer storage trunk and you've just spurred me on -thank you! White jeans are perfect for winter. I don't think they get any dirtier than in summer.... I can get dirty at any time of year! Your bargain hunting skills are fantastic! That jacket is a great find. Purple looks wonderful on you! Gorgeous lady! Mmmm...love all this purple. I have white denim clam-diggers (rolled to just above the knee) that I love in summer.